1 . 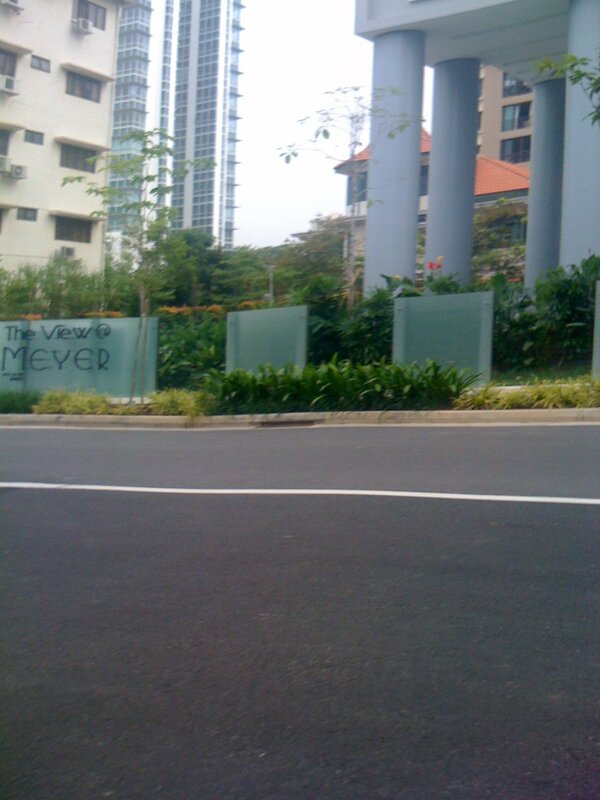 A couple of years back, my mum & dad saw an advert in the newspaper on a condominum development. 2. 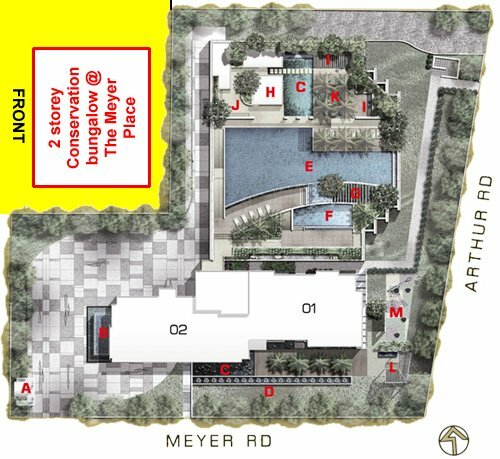 This condominum development is unique in that the government does not allow the bungalow to be destroyed for a large condominum project. 3. 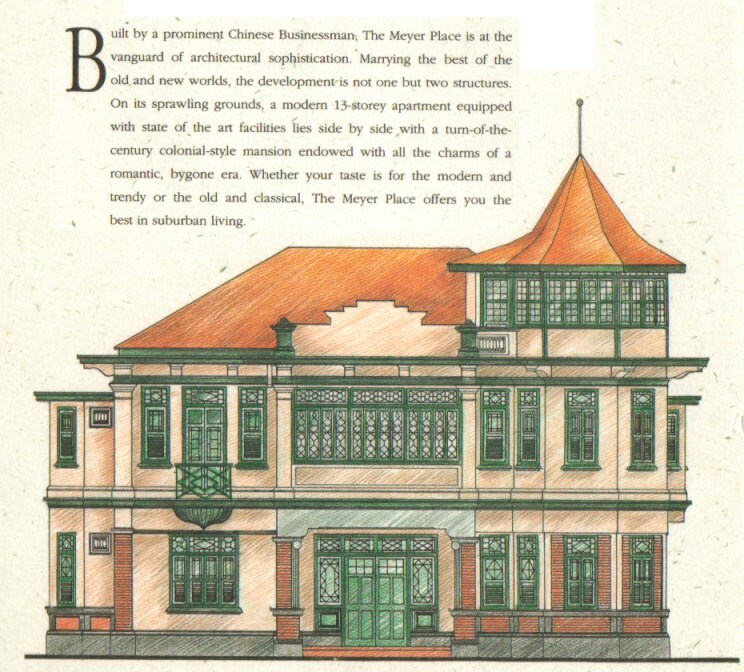 Instead, the developers must restore this 100 year old condominum. 4. Thus a Condominum was built facing the side of this bungalow. Between the two or at the frontage of the condominum is the swimming pool. (A picture is attached). 5. The swimming pool is at the frontage of the condominum. Providing a clear space effect. It is at the side of the bungalow. 6. The bungalow, is divided into four apartments: two at ground level and two at the first level. I personally would not want to get the bungalow, as wealth is being `drained' from it. Furthermore, it is `entrapped' position. 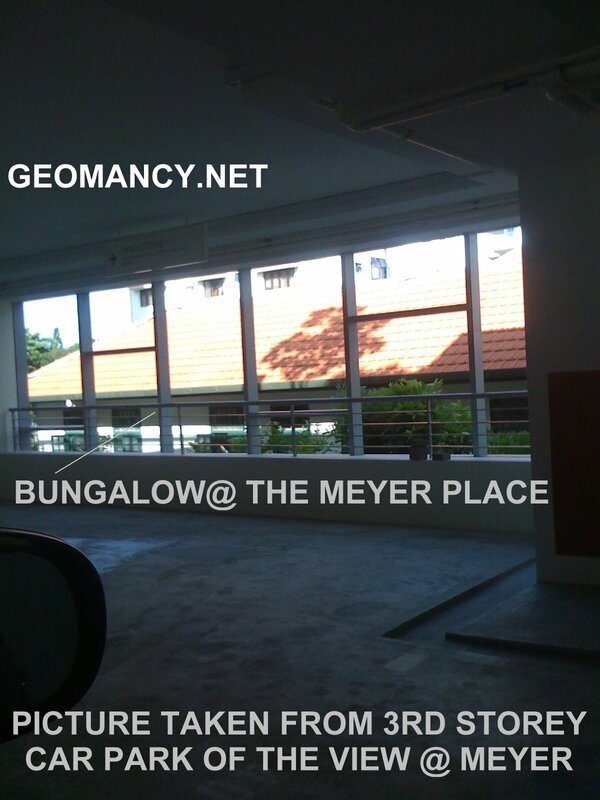 The bungalow unit also `sits' lower than the swimming pool. My neighbour, the owner of ground floor unit (next to the pool), I understand, has been trying to sell his unit since 2 years ago without success. 7. Fortuantely all units in the condominum were taken up except this unit (in the picture) and a second floor unit). 8. I was pleasantly surprised and excited after doing the Feng Shui audit. 9. It has excellent Shapes and Form, quite unique because, under symbolism in Feng Shui wealth literally flows to the roof of the bungalow and since this particular unit was at the fourth floor, as shown in the example, it is in the `receive' position. 10. Thus `wealth' that flowed to the roof of the bungalow, from the combined four units are `received' by this unit. 11. We immediately purchased the unit and have been staying in it since. This freehold apartment was bought at Singapore $600,000 (as the developer offered $50,000 discount as it was the last two units left and they wanted to sell it in a hurry). Today, it would fetch close to Singapore $1.2 million at current market price. Although it does not have a double `7's this fully makes up for the excelent Shapes and Form. It is unique. 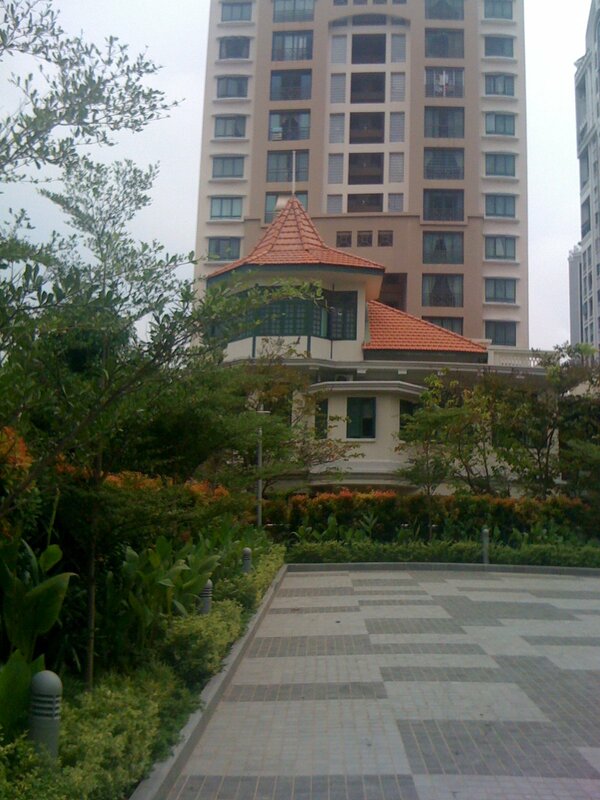 My new house, which is ready in a few months at another condominum has double `7's. Therefore, hope you do spot a `unique' Feng Shui house also. As I mentioned, half the battle is won if one has a good Shapes and Form house. This concept is similarly applied under `The Sterling project' where the unit at the apex, is also at the receive position. My latest acquisition of a new home, does not have this but as mentioned above, has Double `7's. The Good House report module at geomancy-online was used for this acquistion. P.S. Please ignore, the duplicate picture Meyer2.jpg (which was uploaded twice). Attached please find additional pictures on the layout of the place and pictures of the bungalow and condo. 1. The plot of land is an excellent `rectangle' shape. 2. The unit which was identified earlier, enjoys a quantum leap, because, wealth is fed by the bungalow. 3. 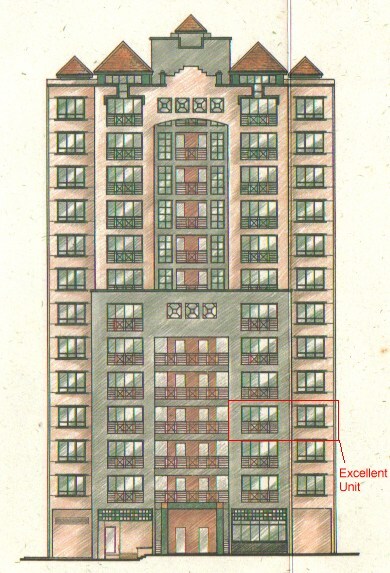 The condominum block is also rectangular in shape and no missing corners. 4. The pool at the frontage of the condominum ensures, clear space. 5. In terms of Shapes and Form, the entire condominum enjoys `excellent' Feng Shui. 6. Unfortunately, the same cannot be said for the bungalow, as all its wealth feeds towards the specific unit of the condominium. 7. Although the specific unit, (as mentioned earlier) does not have double 7 Flying Star, this is a case where, `wealth' literally falls on the owners. Minimal Feng Shui is needed i.e. if one is not aware of Feng Shui, the condo owners, can continue to enjoy good Feng Shui. My observations of neighours staying here is that generally, all are doing very well both in their careers and home. One lesson here, is that if one buys a new home, do get your initial Feng Shui correct. Sit back and relax and enjoy other pleasures of life. What important lessons you can learn here? 1. Where possible always look at the bigger picture. Secondary issues like the placement of a shoe rack or deciding the placement of it outside or inside the house? Covered or not covered are considered `peanuts' Feng Shui. 2. If one lives in a condominum, take advantage e.g. of its large fountain or swimming pool to enhance Qi. Questions like, can I place a fountain in my living room and how long must I turn it on are secondary. In the first place if one purchase a fountain and not prepared to turn it on, then what is the logic of getting a fountain after all. How much Beneficial Qi comes out of a living room fountain (trapped indoors) when compared to one outdoors? 3. 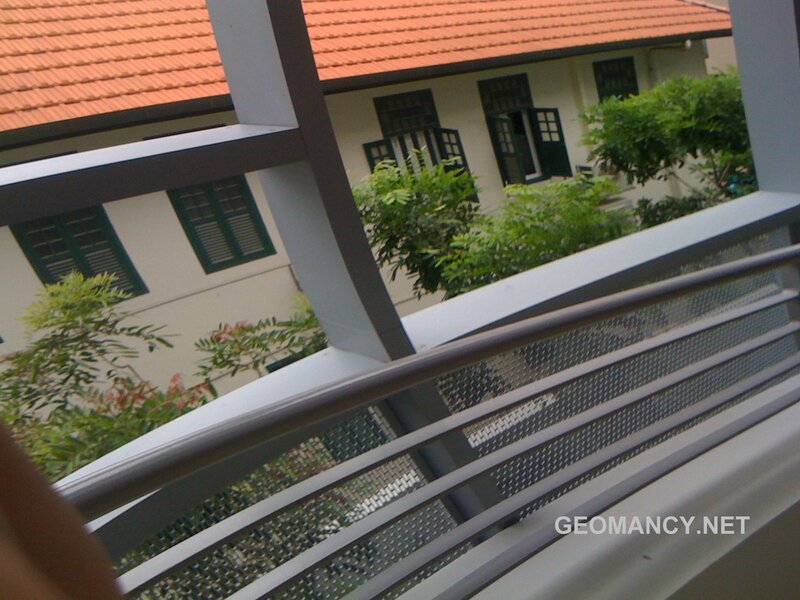 My hope is that we should differentiate between Kindergarten Feng Shui and `correct' Feng Shui. 4. It is less important also to locate the `elusive' wealth corner in the home than to have overall favourable Feng Shui. I hope each of us can ponder over the above and achieve something in our life. 1. 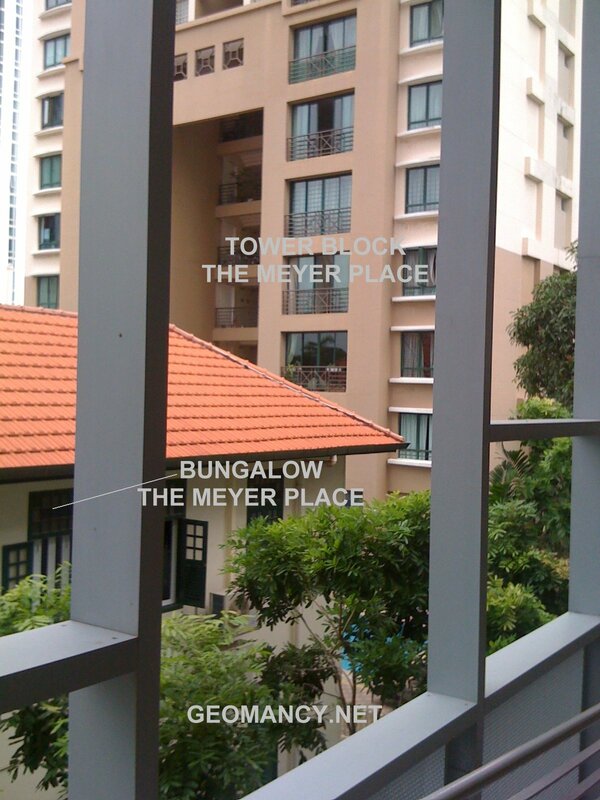 The Meyer Place has two "blocks": The tower block and the conservation bungalow. 2. Formerly, behind the conservation bungalow used to be an open space of the previous hotel. 3. Today, this becomes not only a car park but also a swimming pool on the top deck of the car park. 4. 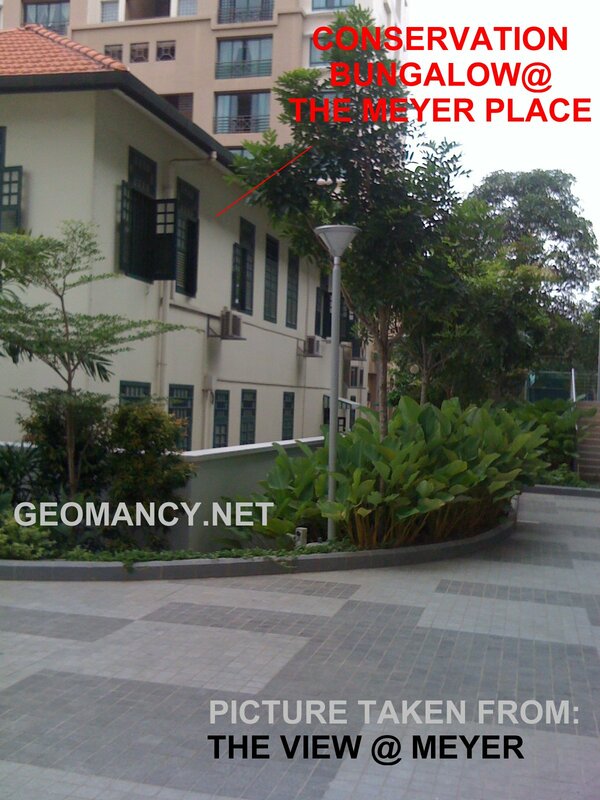 Thus, today, you can say that there is a large water position, behind the conservation bungalow of The Meyer Place. The Feng Shui of the tower block has not changed. 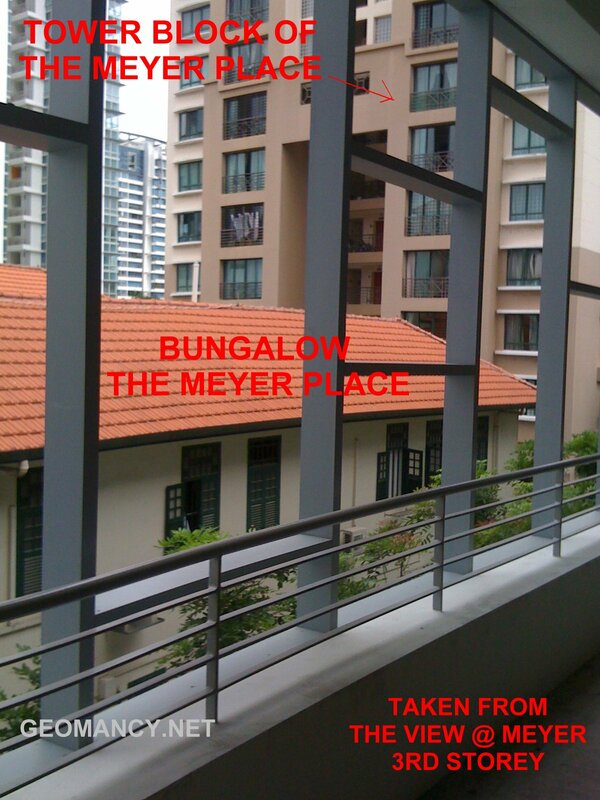 But the Feng Shui of the conservation bungalow, has changed with the newly TOP The View @ Meyer. 4. 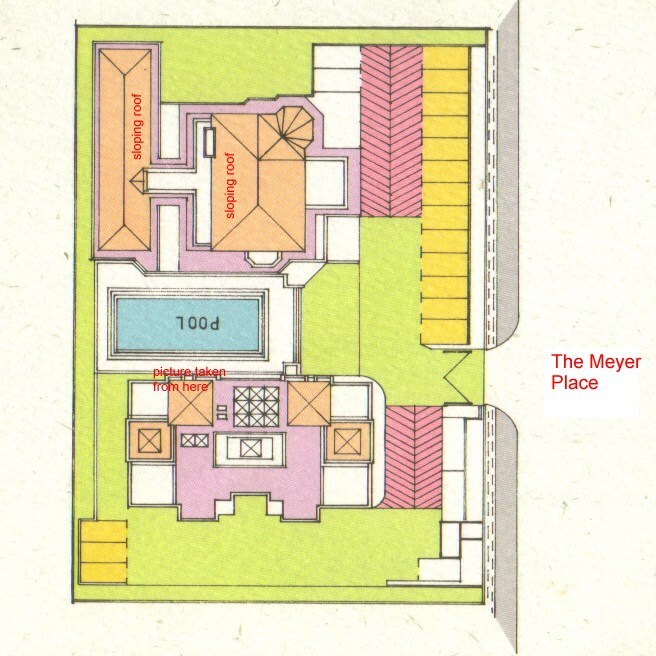 From the site plan; from the top view one can see the swimming pool and the conservation bungalow clearly marked. With some imagination, one will notice that the water position (the swimming pool) is at the back of the conservation bungalow.